Here we are going to review the top 10 personality traits that are unique to the Bengal cat breed. Some items to consider, or understand if you are researching Bengal kittens for adoption. You should always get to know your Bengal cat Breeder, and be able to ask detailed questions upfront. There is more to a Bengal than just the amazing looks. 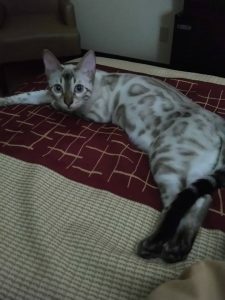 One of the major factors to personality difference with the Bengal cat, is that they are closer to the wild blood line. This means that your Bengal is going to enjoy a raw diet that much more. A balanced diet, including kibble, canned, and raw foods is ideal. There are a lot of recipes available that specifically cater to providing and feeding your Bengal Cat a raw diet. This also helps to keep the Jackson Galaxy suggested “HUNT…CATCH…KILL…EAT!” balanced lifestyle. Bengals love learning tricks and showing them off. Fetch is often expected, however it’s walking on a leash that gets the attention. Be sure to not make them afraid of the leash and harness by forcing it on them. Rather, introduce it early, and in a way that is fun and enjoyable, and it can become a standard activity. Another common Bengal trait is having fun in the water. While not ever Bengal enjoys this, the ones that do certainly make up for it. Either if it’s playing under the faucet in the sink, or full on playing in the tub or shower, your Bengal just might insist on it. Bengals are known for their never ending supply of energy. Even well into their adult life they can continually desire play time from people or other pets. Without enough play time, they can seek out entertainment in other ways, such as getting into food or cupboards. Also, chewable items such as chords, bags, shoes, etc must be kept put away. As with other breeds of cat, the lifespan is determined by their surroundings. A Bengal that is kept indoors, for example, will not have the same life-impacting dangers as one that is let outside, unsupervised, & off a leash. Additionally health factors will have an impact as well. Generally speaking, the average lifespan of a healthy, indoor Bengal is around 12 to 16 years. If you are wondering just how big do Bengal Cats get, understand that the full grown size of an Adult Bengal Cat can differ from a few factors, including diet and pedigree. With that being said, an average Bengal female will weigh just under 10 pounds. The average male will weigh slightly higher, between 10 and 15 pounds. While some Bengals have gotten as large as over 20 pounds, this is not usual. While it certainly isn’t common to hear that someone has taught their cat to perform tricks, it certainly is possible. The Bengal cat breed, however, is known for learning tricks much easier. For treats, they will sit, stay, lay, roll over, even play music. From all of the classics, to something unique, they are a very smart breed of cat. Our Bengals love to play fetch, & this is also common for the breed. Regardless if they are bringing their favorite toy, or catching something you have thrown, they will bring it back time and time again for more. If your Bengal wants something, they are going to let you know. Though I’m not quite sure what they are saying, they are more than willing to carry on a full conversation. One is prone to tattle, and another will sit in the corner and meow just to hear her own voice reverberate. They can be rosetted, spotted, marbled, or different colors such as brown, silver, snow, melanistic, blue, just to name a few. Their fur is amazingly soft. Some Bengals even have a layer of glitter. From this list here, we have reviewed the common characteristics traits of the Bengal Cat Personality. As not all Bengals are going to exhibit all of these traits, it is important to note that you should visit with a breeder. Please base your opinion on personal experience with the beautiful Bengal Cat Breed and not on something like price.